I crawled under my house to rescue... - C.R.A.F.T. 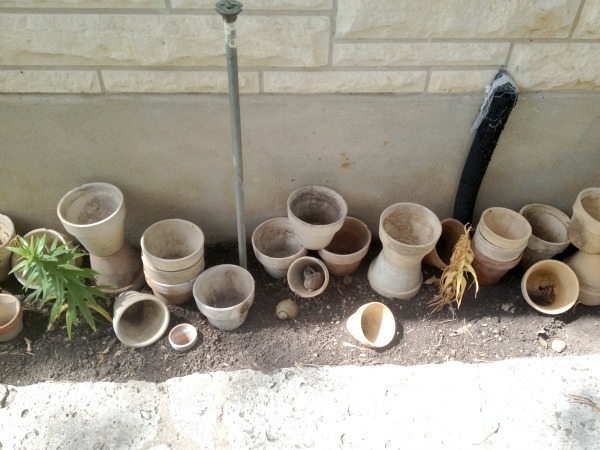 … pots! Clay pots to be exact. Here’s the deal, our house is pier and beam with a concrete skirting. The internet dude came over and had to climb under the house to hook us up, and he let us know there were lots of pots under there! 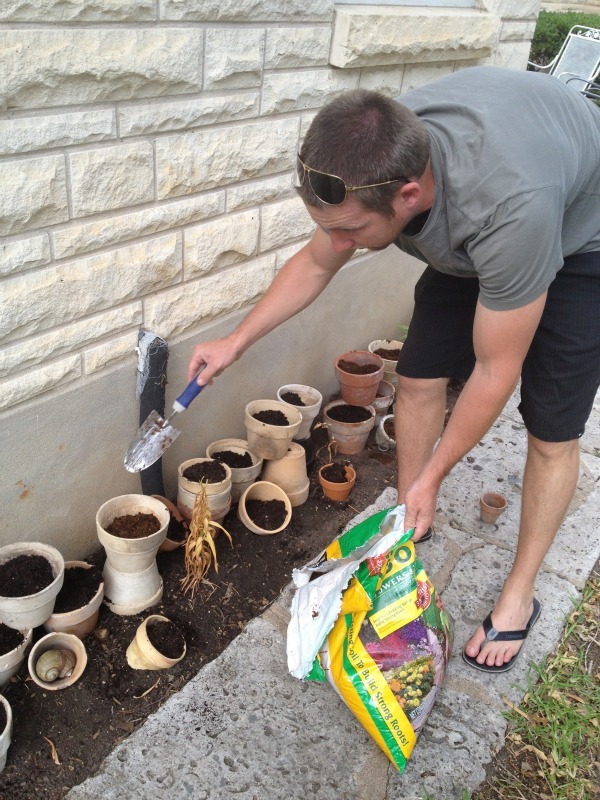 Free clay pots got me pretty excited and weeks later, after I’d gathered lots of courage and felt really brave, I crawled under our house and rescued the pots! 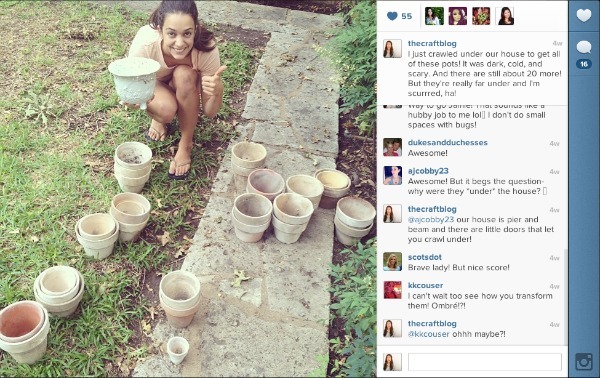 So, the pots lived on the pathway you see in the above pics for about a month. I didn’t know what to do with them. Some are cracked and they’re all kind of the same small-ish size. Around the same time, the lilies I had transplanted into this bed started dying and turning brown and it was sad. 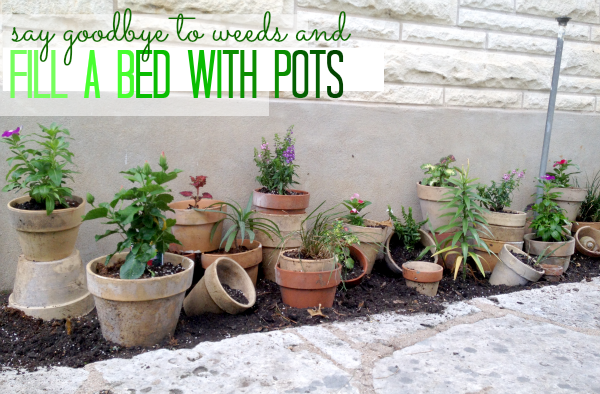 AND there were lots of weeds growing in the bed and well, that’s no fun. And then they all started dying. And worst of all, weeds were growing everywhere. Who wants to deal with weeds? Not this girl. 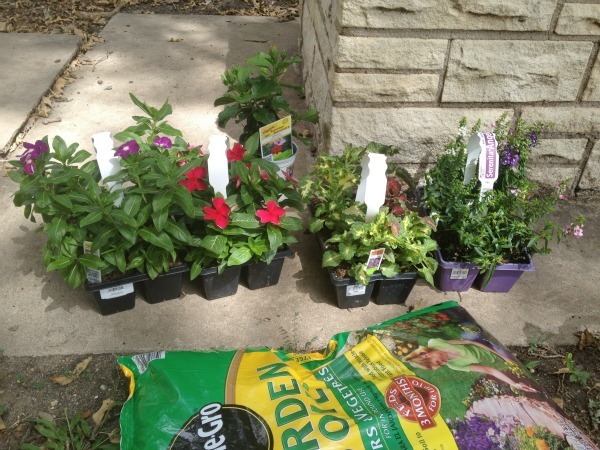 So, in the midst of a weed pulling frenzy, I decided to throw all of my pots in the flower bed and hopefully squish the weeds so they won’t grow back. Smart, right? Will that work? 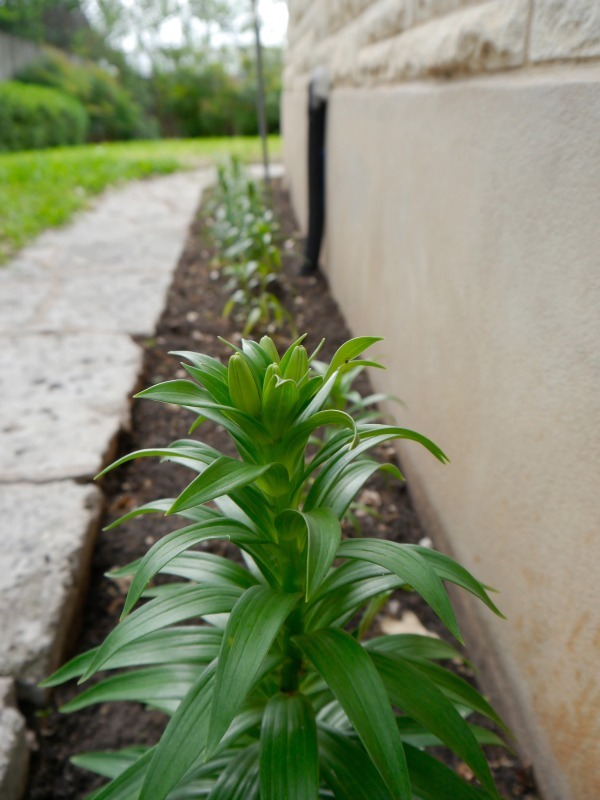 Tell me yes, please : ) I left the few living lillie in the ground. But, see that dead brown thing, that’s what most of them looked like. Boo to dead lillies. I made some pots go sideways, and triple stacked a few, made cheerleader pyramids with some… all kinds of crazy pot things happening in this bed. I didn’t buy enough flowers, so I filled some pots with random plants from around the yard and a few with shells and rocks I had on hand. I kind of love my potted bed. Bed of pots? 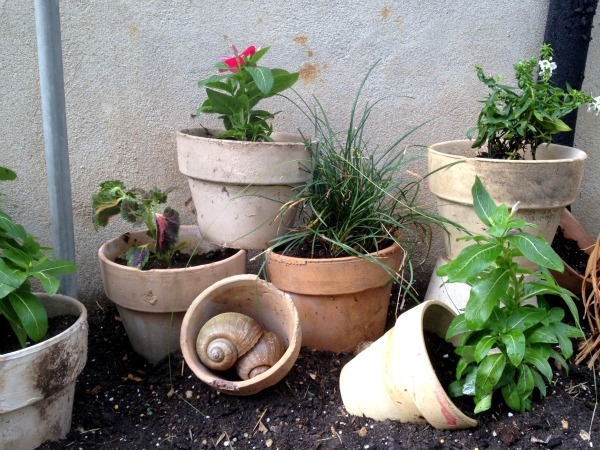 Who plants pots, anyway? I like it, and I’ll LOVE it if the weeds will stay away. 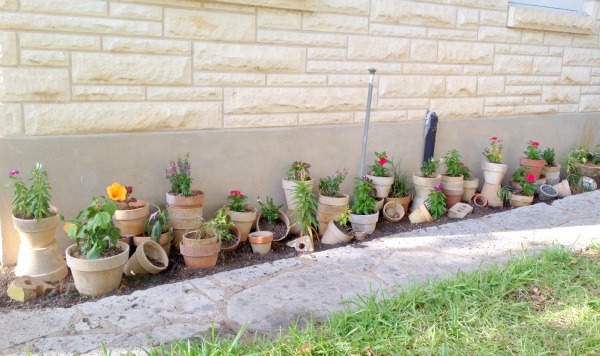 And there you have it… how to make a flower bed out of pots. 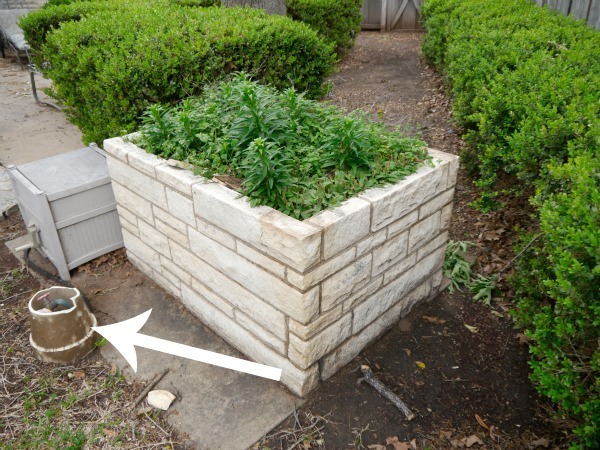 The only thing that was under our old house (before we bought a house that is built on a slab) were spider crickets and the shut-off valve for the water line going to the fridge. I wish I’d found something cool like pots! I think your potted bed is sooo cute!! How creative it is 🙂 Adding the garden art inside some of the pots is just genius! 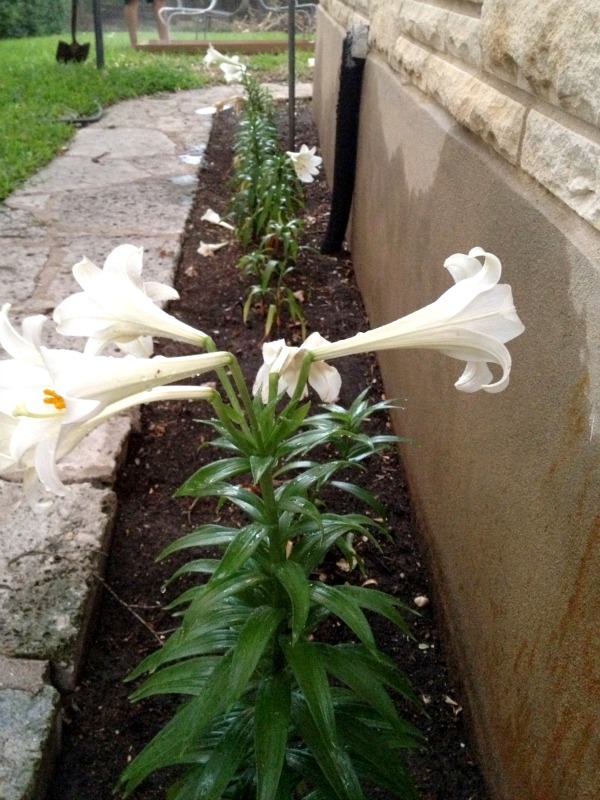 Oh and lilies are like tulips, they grow, bloom then die only to rise again next year twice as big! I hope you didn’t pull them up and toss them! I did not pull up the lillies! Fingers crossed they all come back next year! What a great founds !! What a creative way to use those pots ! 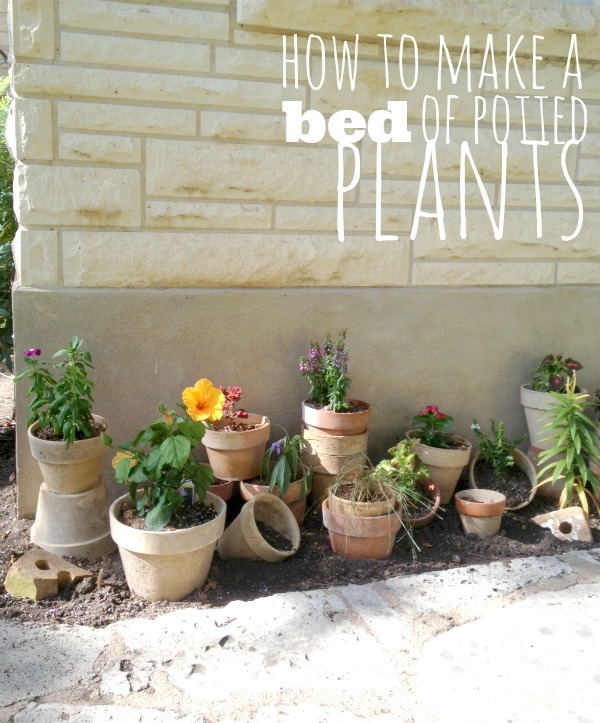 That’s an awesome idea to create a flower bed! It looks really great, it’s definitely something I could imagine also for my own. I am kind of in love with this idea! It looks so fun all stacked up. You are so clever and creative and most of all persistent ….nice job!!!!!! Pam, Thanks for the tip! I will have to look in to that! The one bad thing about my bucket is that water lingers in the bottom :/ I might have to find a new spot for my tools! Why don’t you drill holes in the bottom of the bucket so the water drains out? Wow – I love it!! It looks awesome! You are brilliant and fabulous. When I grow up, I want to be just like you. Achei lindo, mas eu tenho um cão que faria xixi nelas e as mataria. Minhas plantas precisam ser altas. I LOVE it! I’ve been trying to figure out something to go along the back edge of the pool. I do have a bunch of pots- I used to paint them. A bunch have faded but I didn’t want to throw them. I’ve got a bunch of decorative pots also. I think I’ll paint the ones that are unpainted and do something similar but with all the different ones. Oooh! I am so excited. Thank you for your wonderful idea. This is so dang cool and what a great find! 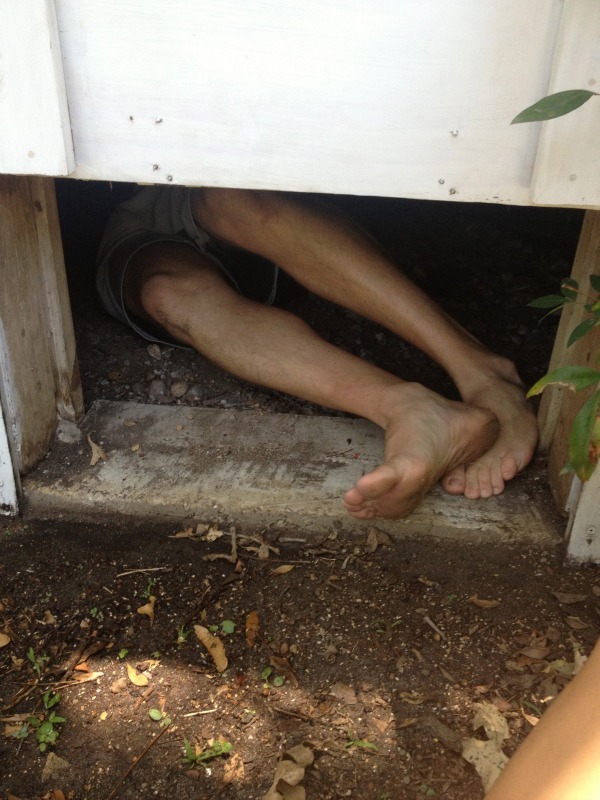 How brave of you to creep under your house, Jamie! 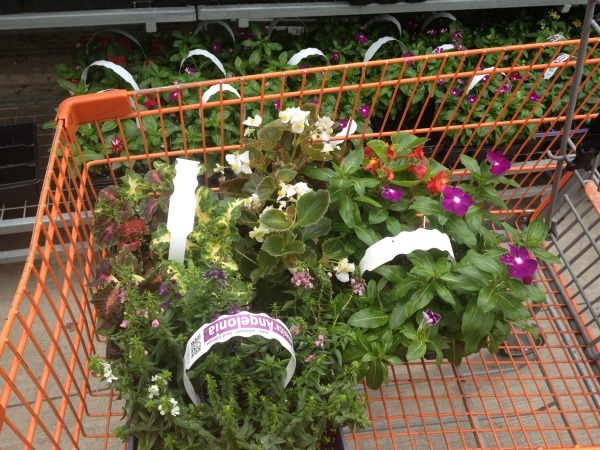 And I love your creative take on a flower bed. Lucky you to find so many pots! I could use some of those. I love what you did with them in your garden. Very creative! 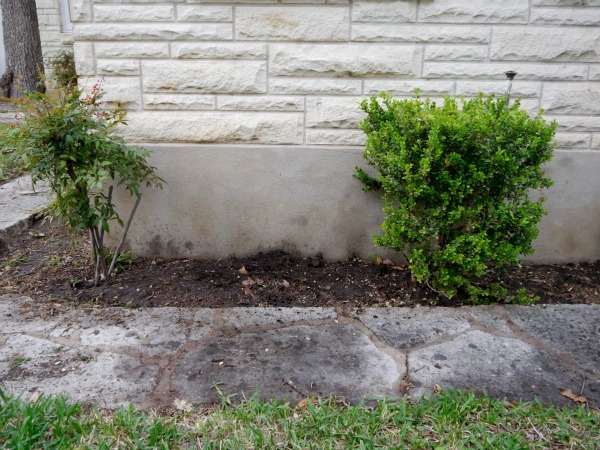 If you still have trouble with weeds, you could try putting down some weed barrier fabric/plastic or an extra layer of mulch. I think I definitely want to put down an extra layer of mulch! I think that helps with draining and water too, right? That’s so fantastic! 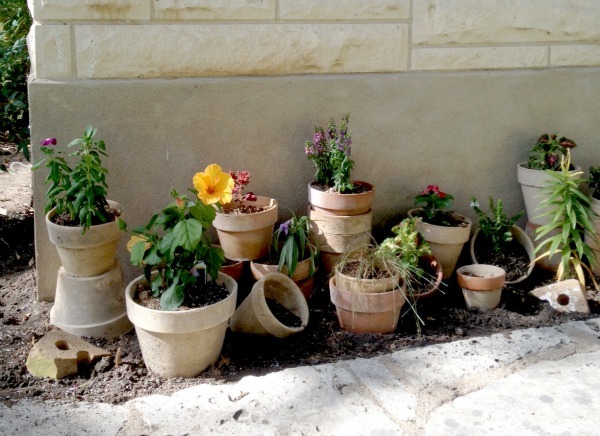 I wish I had a bunch of clay pots hiding under my house! What a great idea. 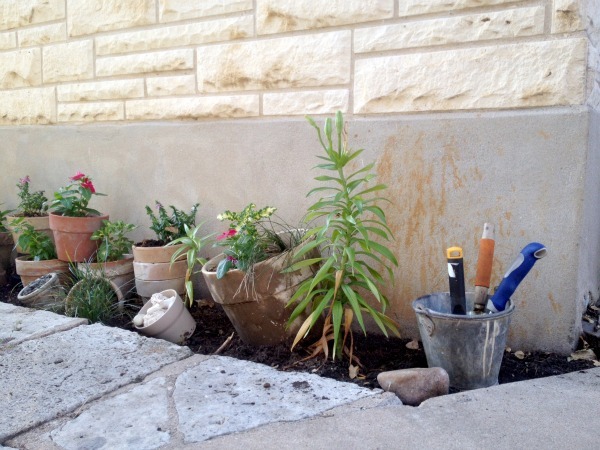 Love your cleaned up flower bed and all the pots. I love this idea, Jamie!! The crawling under the house part? I am SO not that brave, haha! Holy Pots Batman! That is quite a find and you are a stud for going under your house! Great idea on how to use them..super clever friend! Awesome! That is crazy how many pots you had under the house! I love how you used them in the space. Here’s hoping your weed problem is gone! I love the idea and it looks so great. 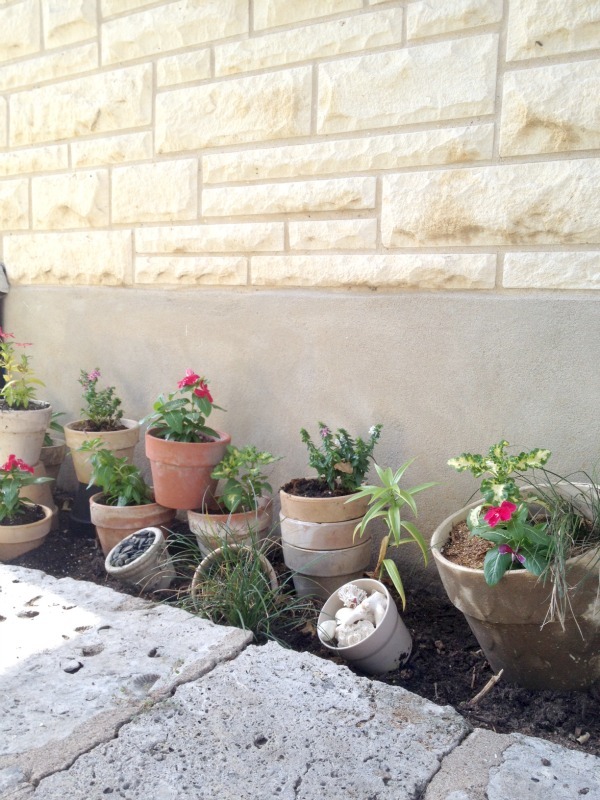 I hate weeding and plant all my veggies in pots but I never thought to do that with flowers. This is such a great idea! I love how it looks! I hope you come link up with us at our ink up party! I so don’t want to go under our house. The pest guy said that the ground was covered – COVERED – in dead ants. Eeww! I absolutely love love this idea, so creative and a must do! I would love for you to share this over at my new link party Making Memories Mondays going on now! Lol. we don’t have anything that interesting under our house. Fun post! Hope your idea works out! I LOVE THIS! Such a beautifully unique way to display flowers! Thanks for sharing over at Motivational Monday! Your flower bed is lovely! Very creative way to use all those pots. I like the idea of adding other items to some of the pots too. Like your shells and rocks. So pretty! Thank you for sharing at Snickerdoodle. Love gardening!